Any dear, regular reader knows I am a huge music geek. I also tend to take things to the extreme, have since childhood. Now my more fiscally conservative self doesn’t buy every available piece of merchandise. Nor do I cover my bedroom walls with articles and posters. 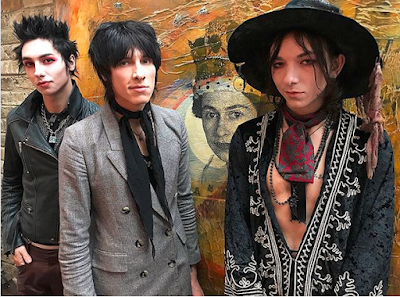 I do know just about everything the brothers of Palaye Royale have ever shared about themselves. They are not shy about telling all on social media. For example, two of them were born in Las Vegas, one of those (lead singer Remington) endeared as a vampire by his fans. Big brother and Canada born guitarist Sebastian dresses in coats and ascots, thus dubbed ‘the gentleman’ of the trio. He also likes his gin. Then there is drummer Emerson, the youngest, a high school dropout and self taught philosopher. His attire of choice evokes thoughts of a certain long-lived Johnny Depp collaboration with filmmaker Jerry Bruckheimer. They are already done recording their next album and are back living on the road touring as I type. I can hardly wait for "Boom Boom Room (Side B)" to drop. Yesterday morning I woke with a rather poetic summation of all this going through my head. My first act of the day was to write it down. Then I typed it and shared on Twitter and Facebook to fellow fans. Have you seen any of the “Pirates of the Caribbean” movies? I think I've seen all the Pirates movies. Nice looking young men, your boys. Some of those films were better than others. ~grin~ They tended to repeat after a while. Heh... But the boys are young. I feel a little like a dirty old lady, actually. ~grin~ Be well! Oh this is most fun. I love those movies too. I'm glad you enjoyed this! Be well, my dear. 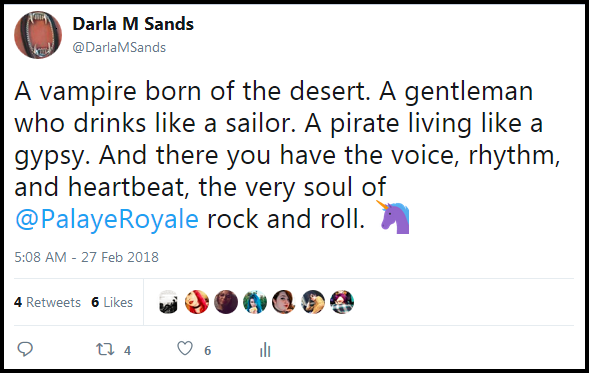 Rooooaaarr... (true story, though I'm harmless) Meanwhile SO likes the music but claims a desire to complain to Nikki Sixx for introducing me. Heh. They sound like an interesting group. 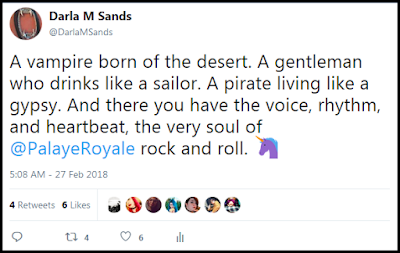 Hubby and I have seen most of the Pirates movies , 3 of them. Was there a 4th? Thanks! They are good. As to your question, I have no idea, honestly. ~hugs~ Hope you and yours are well! Did they reply to your tweet? No, but thanks for asking. They are too busy touring and letting fans share images of big hugs. So I'm good with that. And fellow fans are eating up my idea. I look forward to meeting some, who seem like nice folks. I can't believe anyone would be too cool in their eyes to spend time with you! Be well, my dear.